So many of the world’s areas have always experienced high temperatures. Architects of today are beginning to examine the logic, wisdom and methods of cooling, before the advent of today’s air conditioning systems. It appears our ancestors had some rather ingenious ways to keep the temperatures down, without electricity and create their own sustainable cooling. Low-tech and more simple architectural designs for interior cooling have been around for thousands of years; we just seem to forget the need, since we have air conditioning. Architects are returning to some of the most ancient methods of cooling, using water evaporation combined with building design. In Jaipur, India the art of stepwell structures is being put into place, even though it was previously used over 1,500 years ago. The method involves a pool of water at the base of the building and water evaporation using a system of descending steps. The historical stepwell systems went down many layers below ground level, but the newer design is functioning incredibly with only four layers. In essence, the water evaporation is the cooling model while the earth is being used as a heat sink. This low-tech model is being called ‘passive cooling’ and the term is also being used for any of the design features or technologies being used for cooling buildings without the use of the consumption of power. 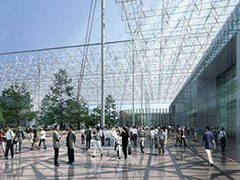 Buildings are being raised above the ground with the use of pillars and areas are created for wind passage and shade. Walls are being constructed with heat-absorbing materials that create a ‘thermal bank’ and the heat is being released during the night when temperatures experience a drop. Sustainable cooling returns us to a more low tech approach and allows us to demonstrate excellence in green eco building methods. In India, the new (and old) plans are being introduced for all new government buildings. The Truth: Global Warming Fact or Fiction? Posted on July 9th under Global Warming Issues. I watch way too much educational television and a couple of the shows have been on ancient architecture. When you see the buildings that these people lived in so long ago, in hot desert areas, without the assistance of the luxury of air conditioning, you begin to actually look at the structures themselves. They learned over the years what works to keep them cool. We need to sometimes stop and realize that we don’t need to waste and we do need to learn from the successes of the past. Why can’t the people of today remember that not everything old is bad. People had to learn to survive in some of the worst conditions and we should be using that knowledge to design stuff today. Air flows, water evaporation and buildings that cool themselves is how our ancestors survived and they didn’t pollute the heck out of the atmosphere and earth to do it. My Dad used to tell me about the ancient Native American villages in Arizona that were built in the same manner. They have long been abandoned, but he said it was hot as heck out there and yet they learned to use natural cooling methods. Why do we forget these things?